The sort of gloriously twisted imagination that came up with the Puffin is probably also responsible for the Star Wars Speeder Bikes (I want one so badly it hurts my brain). 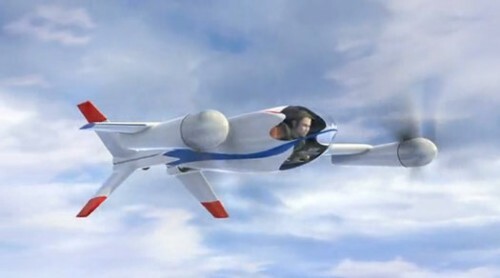 The Puffin, in short is a VTOL electric aircraft designed to accommodate a single, brave passenger in the face-down prone position. It uses the very cool and very new lithium phosphate batteries which means the estimated weight is just over 400 lbs (180 kgs), sporting a top speed of 140 mph (225 kmph) and a range of 50 miles (80 km), not very far to be fair, especially at one-forty but oh what fun it would be! Those propellers are an impressive 7.5 feet in diameter (2.28 m) and they rotate to allow full V-22 Osprey influenced VTOL capabilities.